A peaceful environment full of natural beauty. Visit one of the wonderful tropical destination. Stay with us in the University Paradise of Puerto Rico. Located in the western region of Puerto Rico, San Germán, one of the oldest town in the hemisphere. 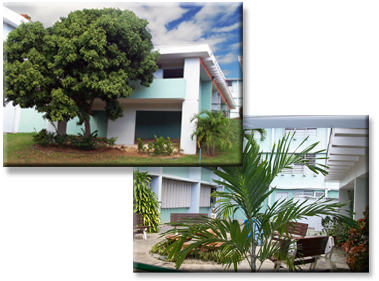 The University Hostel is part of the San Germán Campus of Inter American University of Puerto Rico. The oldest private university in Puerto Rico, with more than 100 years of history. Its privilege location provides easy access to many historical places and the best beaches in "Porta del Sol". As you enter this 29-rooms hostel you will enjoy nature and style. Our University Paradise provides a calm and tranquil surrounding of lush tropical vegetation.